We believe that the Bible is truly God’s Word, written down by prophets and apostles who were "carried along by the Holy Spirit"
(2 Pe 1:21) and gathered under his divine direction over 1,500 years. Therefore we believe it is 100% accurate and reliable in every matter it addresses. We also believe it fully reveals everything we need to know for faith and eternal life—so we call it "sufficient." We reject any effort to limit the Bible’s accuracy to only certain subjects; to speak of it only as a historical document recording the beliefs of certain people in history; or to look for further revelation from God. We believe that God has revealed himself naturally in the hearts of all men through the creation around us, as well as in man’s own conscience. There we find him a powerful and aesthetic God, as well as a God who is just and holy. But we turn to the Bible to find a much fuller revelation in which he defines himself as one eternal God, but three distinct, yet inseparable, persons: Father, Son, and Holy Spirit. We acknowledge that this truth cannot be deduced by human reason, but is grasped only by faith; and we agree with the early Christian church which used the word Trinity ("Three-in-One") to describe this godhead. We describe God the Father as the Creator, God the Son as the Redeemer, and God the Holy Spirit as the Sanctifier. We reject any belief that tries to define God as one without also recognizing the Trinity; or that says that all religions worship the same God. We reject any teaching that makes man’s sin look like it’s not serious; that denies that children are fully sinful; or that denies the existence of hell as a place of eternal punishment. We believe that God delights in saving people from their sin, and that the message of this salvation is the core and foundation of all the Bible’s teachings. We believe that God sent his Son, Jesus, as the promised savior to take our place on two counts: 1) to live a holy life in our place as the "perfect man"; and 2) to suffer the punishment of our sin in our place as our sacrifice. Through these two acts he saved all people from their sins. We also believe the Bible’s testimony that Jesus rose from the dead as he promised, guaranteeing our salvation. He urges all people to believe this message for salvation. "For God so loved the world that he gave his one and only Son, that whoever believes in him shall not perish, but have eternal life" (John 3:16). We believe Jesus’ promise that he will come back to judge the living and dead. We reject the notion that Jesus was not truly God come from heaven, or that he was not also truly man; or that he was confused about his purpose on earth. We also reject the belief that people can be saved apart from faith in Jesus Christ. We believe that the church is God’s household, made up of all those everywhere who call on his name in true faith. For that reason the church is invisible to the human eye but is fully recognized by Jesus: "My sheep hear my voice; I know them, and they follow me. I give them eternal life, and they shall never perish" (John 10:27-28). This church is also called "the holy Christian church, the communion of saints" in our creeds. God desires true believers to gather together to worship him and be mutually encouraged; for that reason they form congregations, or "churches," around a ministry that serves God’s truth. The mark of a church is the gospel ("good news") of Jesus, coming to us in the Word rightly taught and the sacraments rightly administered. Those sacraments ("sacred acts") include Baptism and Holy Communion. The mission of Christ’s church is to go out into all the world and to teach the gospel about Jesus so that more may believe it and be saved from their sins. We hear Jesus’ prayer that the church be one in its teaching and belief, and work hard for that. We reject the error that the true church is visible and identified with a certain denomination. We reject the thinking that all churches should get together, regardless of their doctrine (union without unity). We reject the efforts of many to turn the mission of the church into a simply a social mission of world betterment, rather than a spiritual mission of saving souls. 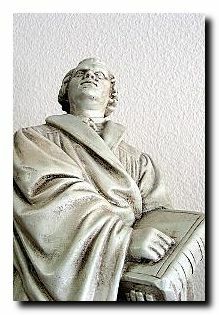 For a more detailed description of what we believe, go to www.wels.net and click on Faith. We share faith and fellowship with the Wisconsin Evangelical Lutheran Synod (WELS), a nation-wide church body of over 400,000 souls and ties to churches in over two dozen countries.